We wanted to breakfast somewhere different, maybe the Brown Dog Cafe in Goodwood? We ended up at Ginger’s Coffee Studio and Vintage Lounge Bar instead. Resembling an old school Chinese restaurant from the exterior, inside is pure hipsterdom: retro fittings, art spaces, breakfast burritos, eggs Bennie with black pudding, designer coffees, etc. 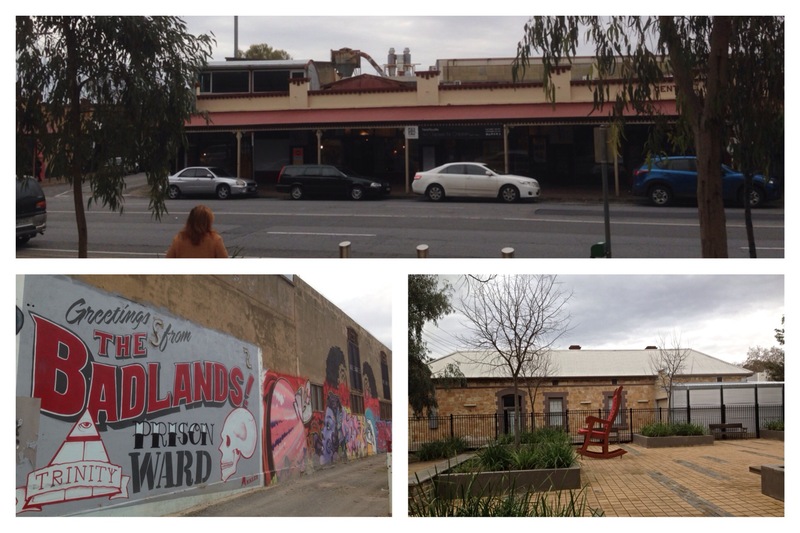 Goodwood Road offered many opportunities to view work by SALA artists, SALA being South Australian Living Artists. I asked what you’d call an equivalent organisation for dead artists? We dropped by the Art Deco Capri Cinema, where more art was on display. Out of nowhere a voice greeted us. I looked around and saw a guy hidden away in a tiny circular ticket booth. There was little evidence of current cinematography. The Capri is a volunteer-run not-for-profit independent cinema aiming to preserve this beautiful old building, it’s original Wurlitzer organ and the heritage and glamour of cinema’s heyday. We will be back. That proved to be difficult given the size and layout of the cafe, squeezing between tables, peering over the patrons’ heads, trying not to be in their faces or in their coffee cups. We decided to look look for some second-hand furniture at the “Salvo’s” shop a little further up the road, and as we left (and because it is Adelaide) we bumped into the photographer whose work we had just viewed. A short car journey took us across town to Magill Road in Stepney, a suburb where antique and bespoke furniture shops outnumber pizza outlets, where the urban and the gentrified vie for attention. For a moment I thought I was in Melbourne. “Do you realise you are the only man in this coffee shop?” K asked me. It did. It’s that kind of a suburb. A giant rocking chair and whole houses given over to antiquity provided for an afternoon’s entertainment, made complete by a browse amongst the vinyl of Big Star Records and a new acquaintance formed with the North Mississippi Allstars.